Background: Who needs botanical names anyway? - We do! man, domestic animals, and wildlife. Essential crops for Asian and Latin American communities since the start of human civilizations, they now offer an alternative to the destruction of rainforests and depletion of carbon sinks by offering a fast-growing renewable timber and tree cellulose substitute. They can be grown for processing into beautiful flooring, high quality paper and soft bamboo clothing. They are also strong contenders for large-scale biomass crop cultivation, for the production of renewable carbon-neutral energy and biofuels. yet it has recently been grown under four different species names, and placed in five different genera. The names vary from legitimate but misguided, to ingenious or downright mischievous. 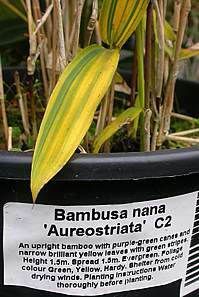 The most widely accepted name for this bamboo is now Pleioblastus viridistriatus. The growing requirements of different species vary enormously. The intrinsic characteristics of different species that give them their individual aesthetic appeal, or make them suitable for any of the thousands of uses to which they can be put will obviously also vary. Therefore it is important to have a reliable and consistent system of names, so that the best species can be selected for growing in the right environment for a purpose to which it is well suited. The enigma of simple plants with complicated names is daunting, but it is a worthwhile challenge and satisfying once the names have been sorted out. In 1981 I started to investigate the planting of bamboos in Nepal for their Government Forestry Department. An initiative to replant deforested parts of the Himalayas hoped to reduce landslides and flooding downstream. Bamboos were one potentially more appropriate crop to add to the non-native pines and eucalypts being grown, especially for community forests. But I was told the farmers didn’t want bamboo seedlings, and heard talk about cultural taboos, and a belief that those who planted bamboos might die if the bamboos flowered. 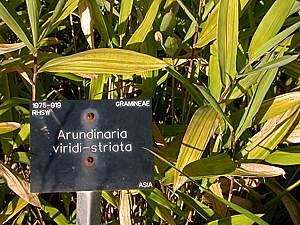 When I asked more questions, I was told that bamboo in Nepal is either Dendrocalamus strictus or Arundinaria sp. 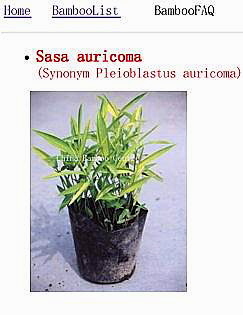 and seed of D. strictus had duly been purchased from India to raise seedlings. A few years later, when I had identified the local bamboos in more depth, I realized that D. strictus did not grow naturally or well in the middle hills of Nepal. The only form native to Nepal, latthi bans, was short, solid and of little use, except for making police truncheons. By 1985 I had propagated a range of much more appropriate and useful species, ones that provided construction timber, weaving material, edible shoots and animal fodder. Plants of those species were very popular, and many mysteriously vanished from the nurseries in the night. There were no more excuses to avoid planting an inappropriate bamboo species. Before there had been information on species names, distribution, their site requirements and uses, it had been impossible for the Forestry Department to provide desirable bamboos. Just as good fences make good neighbours, so good plant names lead to good information. from bamboo poles, while giant pandas munch incessantly and stare out of the deep forest with enormous eyes. Growing some anonymous bamboo in the garden is fine, but if you discover the name of an exotic bamboo and where it came from, you can explore the landscape and peoples from books, maps, pictures and now satellite imagery. Moreover, if we learn to distinguish between those currently understudied and little-known forest bamboos from far-flung places, we might even be able to help to protect them so that they do not become yet more victims of the deforestation and global warming that steadily eats into their natural habitat. And after a trek into the remote bamboo forests of some exotic location, what better than to find the right bamboo to plant at home to bring back those memories of the Himalayas, China or the Andes? So why do we need complicated botanical names? What is wrong with local or common names? Well, local names vary according to locality, which can mean from village to village. In Nepal for example, there are more than 50 mutually incomprehensible languages, so plenty of names. A local name may only mean big bamboo anyway, or edible shoot bamboo, or foreign bamboo. We need more precise scientific names because there are over 1500 bamboos to distinguish between, and many of these share the same local names. Where scientific names have not yet been settled, local names may still be of great use, and they will always help to communicate information on a local scale, helping us to think globally but act locally. The University of Melbourne in Australia hosts a very useful website for local bamboo names, produced by Michel Porcher and friends, which is linked to by genus here. especially to those from the Sino-Himalayan regions of the Himalayas and China. It is also a repository for most of the various dispersed papers I have published, along with preliminary drafts of several I would like to get published, in order to make them more accessible. 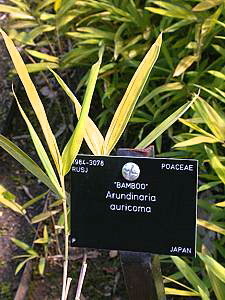 Note, however, that identification of bamboos is still in the early stages of development. Their taxonomy lags far behind that of most other flowering plants, and there are still more questions than answers. It is realistically expected that many bamboos will become extinct before they are properly known. Their habitats can easily shrink and disappear, along with the animals that depend upon them, as a consequence of habitat erosion or climate change, especially when a bamboo species is found on an isolated island or mountain summit. Hopefully this site might stimulate further investigations to reduce the number that slip away. As they flower so infrequently and their seed cannot be stored for long, no seed bank will allow them to be brought back after they have gone. If we do not study them, improve the accuracy and consistency of the names applied to them, and learn how to distinguish between the different species in the field, then how can we ever hope to conserve these vulnerable but very useful plants? Two recent reports have highlighted the frightening vulnerability of forest bamboos. Few are protected in-situ. 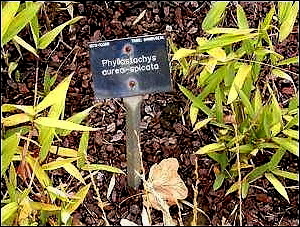 Only a small proportion of bamboo biodiversity is currently cultivated and thus given some form of ex-situ protection. The bulk of forest bamboo species are highly vulnerable but completely unprotected, and many are still unnamed and completely unknown to science. If we have not undertaken the basic taxonomy and do not have proper botanical names for them, how can we possibly hope to conserve rare and vulnerable bamboos for future generations?